In honor of National Nurses Week, May 6th-12th, addressing roles of nurses in hospice care can help others understand how hospice care will benefit end-of-life patients in their home-like setting: the personal home, long term care facility, assisted living community, hospital, or in-patient residence. Nurses play an integral role in caring for the hospice patients including visiting patients for an initial assessment, planning care visits, determining medication and equipment needs, and working with patients and families on their goals of care. No matter what setting best meets the needs of patients and families, hospice nurses collaborate with the caregivers or healthcare facility’s employees to ensure their pain and symptoms are controlled during their end-of-life journey for a more peaceful experience. Personal Home: In the private home, the family is the primary caregiver. Nurses provide intermittent care with scheduled visits determined in the goals of care meeting from an inter-disciplinary team of physicians, nurses, social workers, hospice aides, and volunteers. The nurse can update the family on what to expect in the coming months or days; how to respond to physical or emotional changes; educate them on medication and equipment needs; and order equipment as needed to ensure the comfort of the patient. Long Term Care Facility: Hospice nurses collaborate with nursing facility employees to offer added support to their team. The visits are scheduled much like in the private home. The primary caregiver, however, is usually the long term care facility employee due to a higher level of care needed for a patient. Nurses communicate with the facility employees to ensure, in addition to the excellent care they get from the facility employees, the specialized care received from hospice nurse is supporting both the patients and the facility. Assisted Living: Hospice care is an extension of the care already provided by the Assisted Living Community. Hospice nurses assist with changes in condition, family dynamics, and impending death with regularly scheduled visits determined by the goals of care meeting. Hospital: In order to receive hospice care in the hospital, also known as general in-patient services, patients need to meet specific criteria as determined by a physician. During the stay in the hospital, a hospice nurse would work with the hospital staff to control symptoms to ensure patient comfort. Hospice Home or In-Patient Residence: Normally, the hospice nurse goes to the patient in their home-like setting. There are also hospice homes or in-patient residences that provide 24-hour care for patients who have a need for a higher level of care to allow the family to remain family and not a caregiver­­. These homes are unique. While many may prefer to live their final days in the comfort of their own home, for many reasons, this may not be possible or practical. 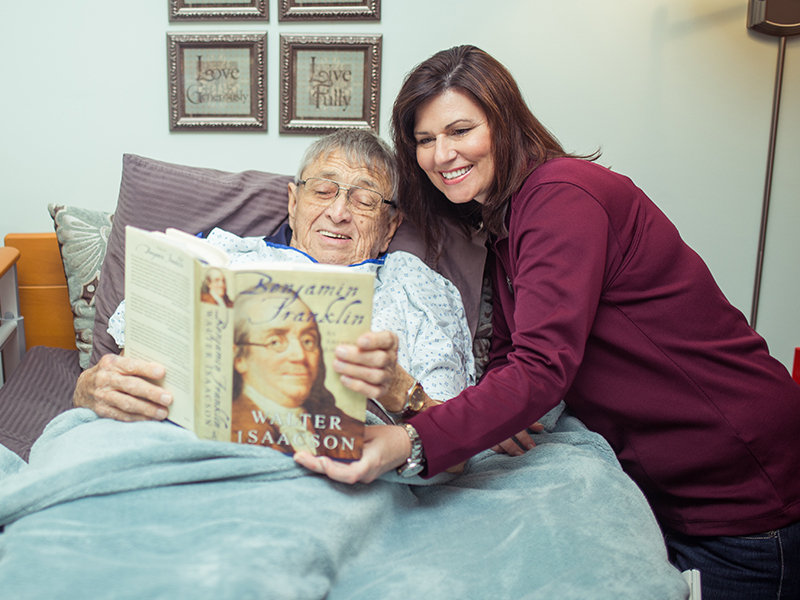 A hospice home offers that home-like setting with the specialized nursing care that is best for the needs and wishes of the patient at the end-of-life. Hospice of Southern Illinois is your community not-for-profit hospice serving 27 southern Illinois counties since 1981. Our mission is to enhance the quality of life for individuals and their loved ones touched by a terminal illness. On behalf of Hospice of Southern Illinois, we want to thank all the nurses who dedicate so much time and compassion to their patients.